I’ve been wanting to experiment more with gluten-free recipes since I have a few friends that eat gluten-free, and I am wanting to shy more away from it myself. These cookies are a result of that desire, and although they were kind of an experiment, they turned out so good I simply could not stop eating them (as in “6 cookies in 1 day” kind of good). These cookies have some of the heartiest ingredients I know and love, making them more like a healthy snack than a true cookie. But I’m really not much of a butter-and-brown-sugar type of cookie girl anyway, so these suited my fancy much more. -They’re seriously addicting… Temember my 6-in-1-day comment? I loved that these cookies were delicious right out of the oven and seemed to become even more delicious after they’d cooled. They became a bit more soft and banana bread-like. Even John had a few, and he’s not much into health food hippie cookies. Success! 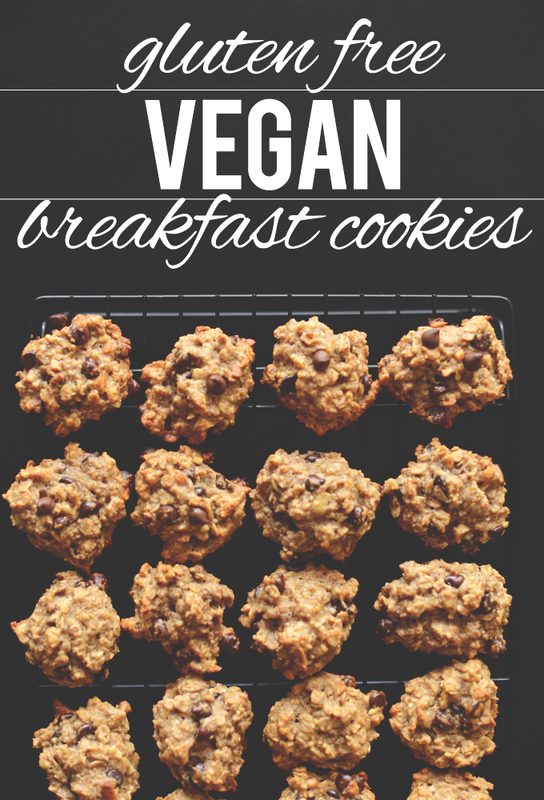 If you’re looking for more banana-based, healthy cookie recipes try my Vegan Everything Breakfast Cookies and my Chocolate Chip Banana Bread Bites. They continue to get rave reviews. Enjoy! 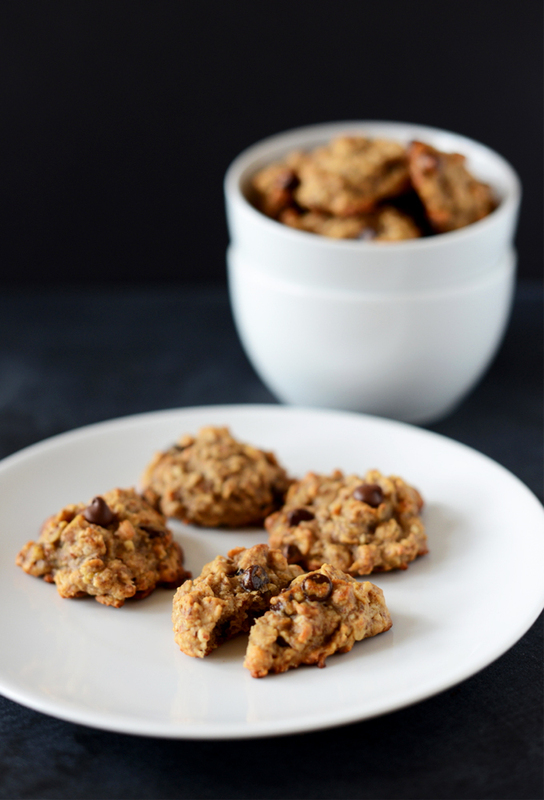 Tender, not-too-sweet breakfast cookies made with bananas, flaxseed, oat flour, rolled oats, almond meal, and lots of dark chocolate chips. Gluten-free and vegan! Let rest on baking sheet for a few minutes before transferring to a cooling rack. After completely cooled, store in an air-tight container to keep fresh for up to a few days. Refrigerate or freeze for even longer storage time. I made these with sunflower seed butter and sunflower seeds so they are a little darker than shown in the pic but quite good. 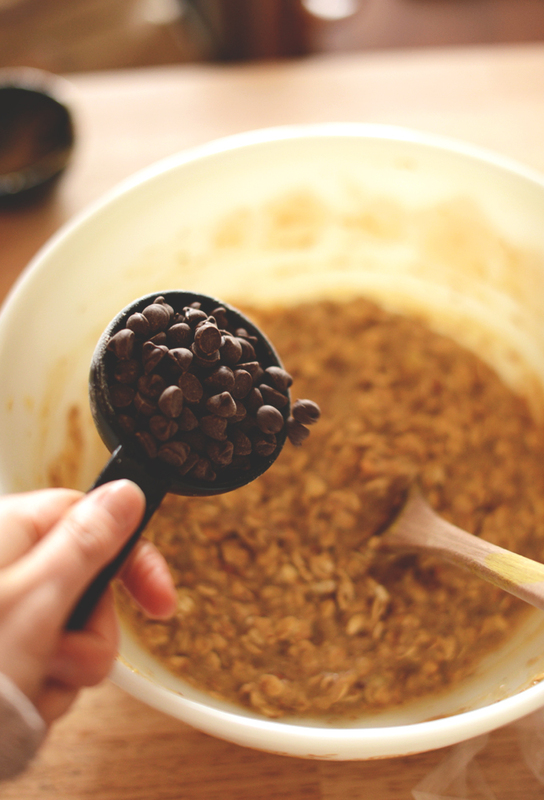 If I make them again, I’ll put half raisins and half chocolate chips. I put a little less agave than called for. Overall, a very nice cookie! Lots of yummy ingredients, although 14 of them? Minimal, I thought? :) However, they were easy to make and absolutely delicious. All the flavours complimented each other and such a lovely texture. Thanks so much for sharing such a healthy recipe. Great recipe! I love this site for the great variety of plant-based recipes for my daughter and myself. I am always looking for easy breakfast recipes for school days. I didn’t have almonds or almond meal on hand so I just used all oat flour and added cacao nibs and pumpkin seeds. Delicious!! Yay! Thanks for sharing, Stacy! I’m pretty sure I’ve left a review before. These are my go-to breakfast cookie. I always make a double batch and have them in the freezer. Today I used white choc chips and added dried blueberries. FANTASTIC!!! I’ll never not add blueberries ever again – LOL! 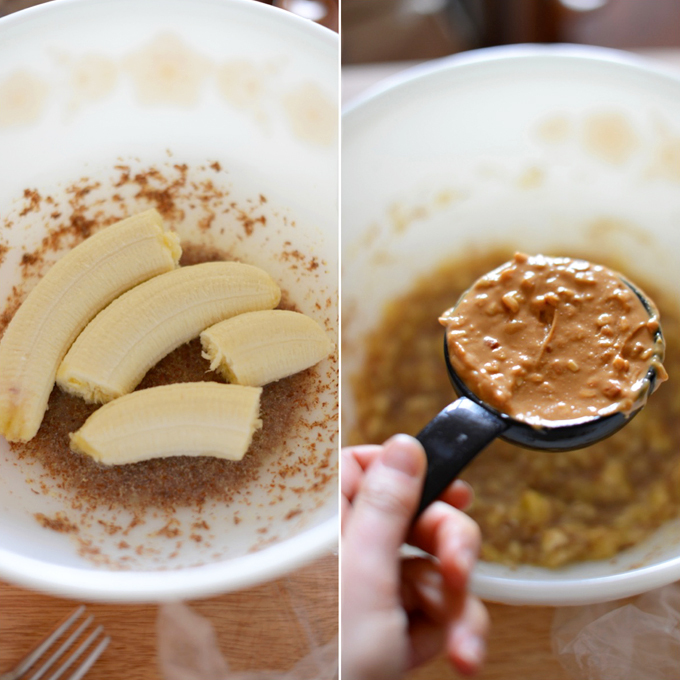 I love this recipe and altered it to be a breastmilk booster as I’m currently breastfeeding. I used 1 cup of almond meal instead of 1/2 oat 1/2 almond. I also added 4 tbsp of debittered brewers yeast and used only 1/4 cup of chocolate and cut up dried apricots for the other 1/4 cup for extra sweetness and milk booster. Fantastic! Thank you for your expertise and guidance! Smart! Thanks for sharing, Shelicia! Hello! These look delicious, but I have 10 people in my home, and I’m trying to make enough for a couple breakfasts during the week. Do you think I could double this recipe and make it a half-sheet size pan as a “pan cookie,” then cut them in to bars? And, if so, would you change anything about the prep or bake time? Also, do you have any other g/f, vegan recipes, like this one, that would work well as large batches like I described? I’m interested in entree ideas too. I’d love to try them! I get tired of casseroles. Hi Susan! I think that would work, but you may be interested in checking out either our Crunchy Baked Granola bar or our Healthy 5-Ingredient Granola Bars. Hope this helps! My kids loooove breakfast cookies! Recently, I have had to start eating gluten free. This recipe has similar flavors to a recipe that I have made for my kids in the past. Everyone in my family loved this recipe! I used blanched almond flour in place of the almond meal, and chopped pecans instead of walnuts. I ground my own oat flour in the blender, which was 45 grams of oats for the 1/2 cup (just in case anyone else was wanting to do it by weight). Thanks very much for a great healthy GF breakfast recipe! So good! 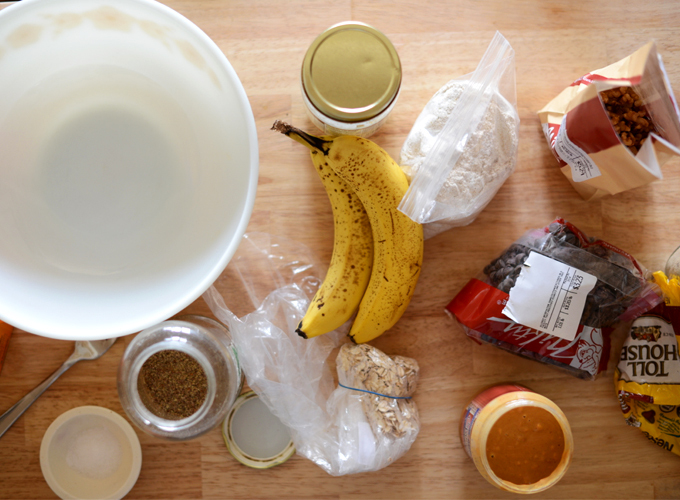 I wanted to make something with overripe bananas and came across this recipe. I didn’t have any almond meal and didn’t need the cookies to be GF so I subbed for half spelt flour and half hemp protein – might try increasing the latter next time for an extra protein boost. I didn’t have any nuts on hand but they still came out great! Not too sweet, filling, moist, and delicious! Thanks for sharing your recipe changes, Irina! We are glad you enjoyed them! I made this and it came out so well! I halved the recipe just to test it first but next time I think I’ll double it…! I also baked them in a muffin tin to make life easier and to get more even sizes and it worked out great. It’s also really easy to experiment and modify things according to your liking (as I did above). I would recommend this! Thanks for sharing your recipe changes, Sam! Glad you enjoyed it! Can I use regular peanut butter with no added sugar instead? I made these this morning for the first time, and they are absolutely delicious. I did have to make quite a few substitutions because of allergies: I used Sunbutter instead of peanut butter; I used an unscented olive oil instead of coconut oil; I used more oat flour instead of the almond meal; and I used raw pumpkin seeds instead of the walnuts. Even with all of those substitutions, we ALL loved these, even my picky toddlers. My 3 year old had two. (yay!) I’m going to make another batch this afternoon to freeze. Thanks for yet another fantastic recipe! Glad to hear your little ones enjoyed the recipe, Megan! Thank you for sharing your substitutions as well! I love these cookies! I’ve made them several times. Sometimes I change up the toppings a bit. Instead of walnuts and chocolate chips I’ll add diced dried apples, raisins, nutmeg and cinnamon. Or raisins, walnuts and cinnamon. This recipe is so versatile! I love, love your recipes! Thank you! Any advice on how to make this more of a crunchy cookie, rather than soft/chewy? Hi Amy! 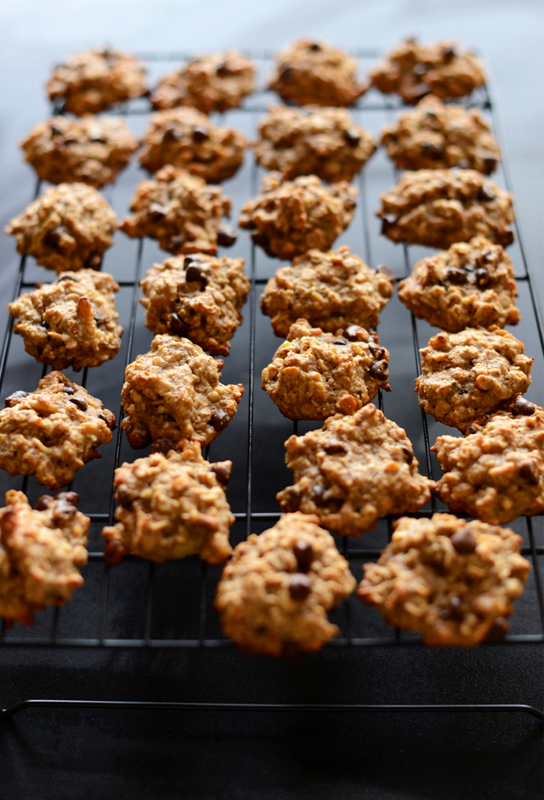 I would try baking these for longer at a lower temperature to make them more crunchy! This will allow the cookies time to spread before they firm. It will also help dry out your cookies as well. Additionally, more nuts will make for a crunchier texture! I am not a baker but this worked for me and it is an easy recipe to make substitutions on. Made it mostly for my 14yo daughter with braces who wants a meal replacer on hand when she’s running late in the morning. She liked it! Will be making again but will see how it turns out with all blended oats. Got 13 double sized cookies using a 1/2 c measure, baked 28 minutes. 1/2 c raw almond butter for the pb. Also I put the flax eggs + bananas + almond butter in the blender because I wanted a smooth consistency before mixing the rest of the ingredients. Yummy! Didn’t have enough almond meal so subbed with 1/4 cup of hemp seeds. Also subbed the chocolat for cranberries and raisins. Will make this recipe often. Thank you for an’other great low sugar treat. I m happy I found your page. Thanks a ton for the recipe, it turned out great. It’s hard to find maple syrup or agave in my city, so I used homemade raisin syrup… tada..! It worked.! ? Just coming to say that I make these at least once every two weeks but leave out the flax and the almond meal, sub quick-cook steel cut oats, and add raisins, and everything is perfect. Basically the best post-workout breakfast when you have to get straight to work. Soooo delicious! I substitued 1 cup canned pumpkin for the bananas. Excellent recipe! Thank you! Can I use spelt meal instead of oat flour and almond meal? Hi Martina! Yes you can! Thank you for a great recipe! I make these often, using almond butter instead of peanut butter. I also leave out the nuts and chocolate chips, but I just found a dairy free chocolate chip, so they will make an appearance in the future! I’m planning on adding some dried blueberries to my next batch. I’m also planning a batch with pumpkin puree and pumpkin pie spice instead of banana. Hopefully it will turn out well. I love this recipe. I follow it exactly & have made it a number of times. I love the almost cake-like texture and flavour. So good & worth making! These cookies are a staple in our household. Thank you for the most wonderful and perfect cookie recipe. My new favourite cookie recipe. Seriously, SO good. My 3.5 year old and 13 month old each devoured 3 in one sitting. I had about 4 haha. You’re the best vegan blogger! We are GF but not vegan – can i just use two eggs instead of the 2 flax eggs? Hi Dana! Do you have any suggestions for something I could sub the oats and oat flour for? I recently did a food intolerance test with my naturopath, and sadly, oats is one of the things I have to eliminate for a few months. And I’m looking for a healthy breakfast cookie recipe that my toddler can also eat – it’s surprisingly hard to find one that is both gluten-free and doesn’t include oats! Thanks! Hi! You can sub the oat flour for almond meal, GF cornmeal or millet flour. You could try quinoa for the oats! My cookies look really close to your pics. Really good but the flavor is unexpected. I’m not getting much. If I were to try again I’d use spices. I’m also not a fan of the crunchy outside and soft center. Raisins sound tasty. My husband and I recently went (mostly) vegan and I wouldn’t be able to survive without your blog. Everything you make is ridiculously amazing. Like these cookies. Very filling – I could have two or three of these for breakfast with a cup of tee and feel great. And not too sweet! These are ADDICTING! I felt lazy, So I subbed the almond and oat flours with whole wheat pastry and they turned out fantastic. Are there any health alternatives to bananas? We (unfortunately) have banana allergies in our household. Thanks! Avocado maybe work for a similar texture!? Just compensate with more sweetness. You need something sticky and kinda thick like bananas. Hope that helps! Additionally, check the comments as others had success with zucchini! I have a question about the almond meal. I buy raw organic almonds and make my own almond meal, flour and milk. I noticed that once in a while I come across an almond that has gone bad and tastes horribly bitter, I accidentally ate one a few weeks ago and the bitterness was so bad that I couldn’t get the taste out of my mouth the whole day. Now I am kind of afraid of making my own almond products in case one bad almond ruins the whole batch. Is there any way to tell which almonds are bad? Is there some kind of test to separate them? not too sweet and very healthy. this recipe is definitely a keeper~ thank you! Can you use ground flax seed or do they have to be whole? If so, would the measurements change?? Thanks!! Simple and easy recipe. I omit the agave and only use one banana to reduce the unnecessary sugar intake as much as possible and still tastes dealicious! These are my absolute favorite cookies! They are currently how I choose to make chocolate chip cookies. I love the mix of banana, peanut butter and maple syrup floavor (I don’t use agave). Yum! Thanks! This recipe and all the other recipes I tried from Minimalist Baker never fail and this is more delicious and healthier than a regular chocolate chip cookie!! Thank you for this recipe really enjoyed it came nice and delicious I love all your recipes. ? I often substitute pumpkin or sweet potato puree for bananas in muffins or recipes such as this. Dana uses flax eggs here, which is ground flaxmeal mixed with water (1 T flaxmeal+2.5T water). You mix it and let it sit 5 minutes. Ground chia seed meal also works mixed with water instead of egg. I use almond butter instead of peanut butter. These turned out great! Super quick too. I used honey instead of agave. I made them for my husband and toddler – I split the batch. Half with chocolate chip and half with raisins for my daughter. I am enjoying both kinds:) Next time I might use chopped dates instead of raisons, and maybe add a touch more sea salt to the chocolate chip ones. 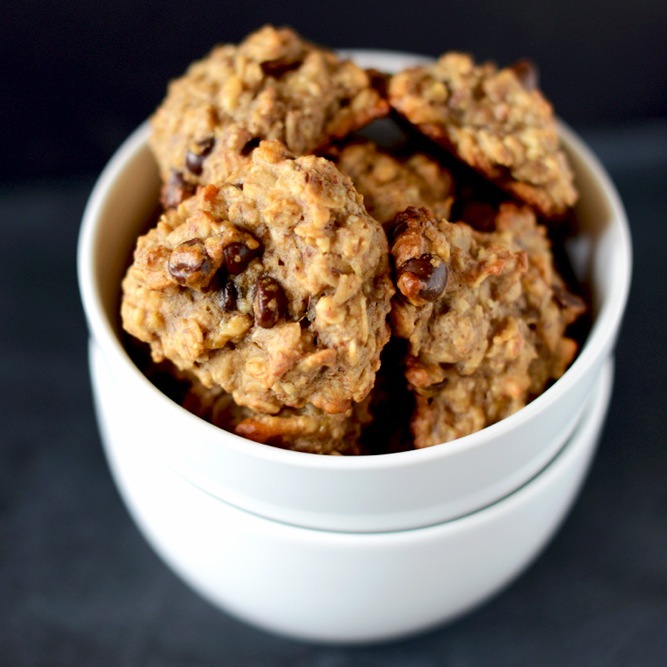 These would also make great lactation cookies or even a great gift for new moms. I made a heavily modified version of this to suit my own dietary needs and what I had in he house. I subbed 1 cup of peanut butter powder for oat flour and peanut butter. I used eggs and butter instead of flax and coconut oil (not vegan, and out of coconut oil which was sad), threw in a scoop of protein powder, and used Reese peanut butter chips because I’m allergic to chocolate. I ate 5 in the first day!! These are so yummy! I calculated the nutrition using myfitnesspal and my version had 6 gm of protein per cookie, which I was really happy with! So I just HAD to make these…they are great! 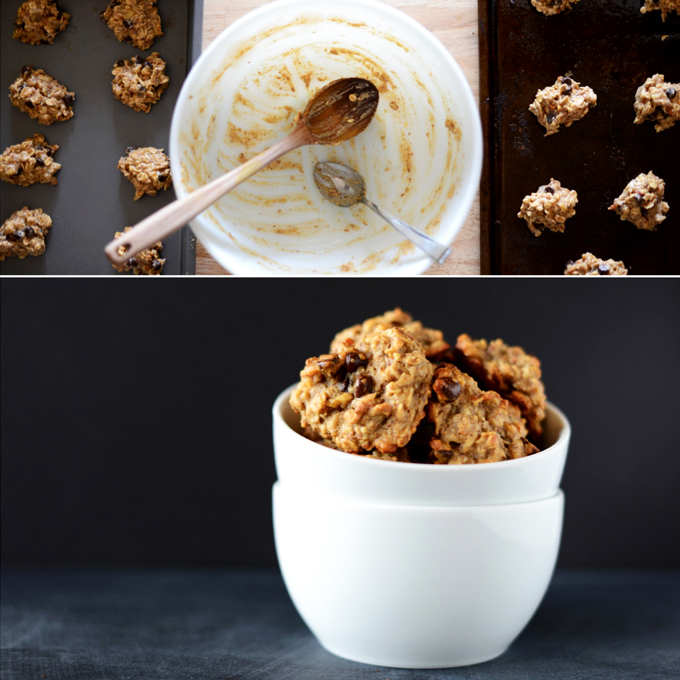 I made some substitutions and additions….used 1 banana (sensitive to too much banana) and 1/2 c unsweetened applesauce, then added cinnamon, raisins and dried cranberries…..VERY DELICIOUS! I am still trying to understand “breakfast cookies” I have been finding many recipes by that name…but I will take it…LMBO! Thanks for creating a gluten free vegan recipe…new fav! Such a wonderful and easy recipe with easy ingredients! I made as directed with the addition of cacao nibs, unsweetened coconut flakes and a tiny bit of agave syrup to the top. Perfectly moist little cookies :D Thank you for all of your awesome vegan recipes! cacao nibs and coconut flakes sounds DELISH! This cookies are the absolute best! Have been sending the recipe to everyone and anyone! Full of the perfect blend of a bunch of flavors– none of them overpowering the others. I substituted dried cranberries for walnuts (not such a fan) and they add a little bit more flavour. Love them! The best! I love your recipes. My kids devoured these, including my 15yr old son who doesn’t like anything “healthy”. Thank you. Hi! These look delicious! I’m avoiding peanut butter right now. Do you think it should still work without it? Thanks for the recipe! I’d recommend subbing something else, like almond butter! I’m really new to this kind of baking and had to do some subs I thought I’d share! We can’t do tree nuts or peanuts so I used sunflower butter instead of peanut butter and coconut flour instead of almond meal. I used cacao nibs instead of chocolate chips. They came out great! Hi! Can I use almond butter insteAd of peanut butter? Am dying to try these!! Ils sont tellement bons!!! Je les adore pour le déjeuner! Yum! Very good! Will go well dunked in my tea! Hi there, I am looking at making a “fruit pizza” with a oatmeal crust, do you think this would work? I’m assuming the flax gets added at some point? I have made these cookies so many times now and, without fail, have been asked for the recipe every single time! What a score! Super easy to make, healthy, and delicious! 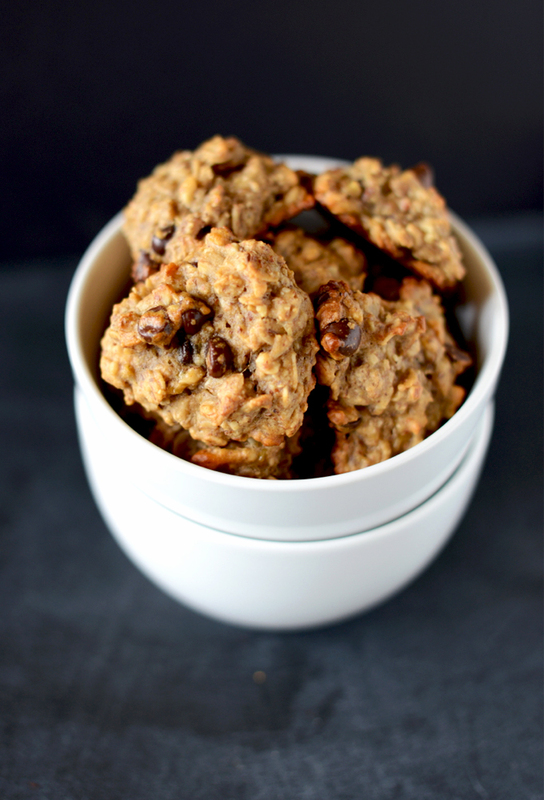 I’m seriously in love with these hearty, filling, delicious cookies! Yay! They really are still one of my favorites! What can I use besides banana and peanut butter in these? I prefer sweet potato, pumpkin & apple flavors. My 4 year old has multiple food allergies and we LOVE these cookies! I’ve made them a couple times following the recipe exactly and they turned out great. I recently discovered that she can’t have oats anymore, so tonight I tried substituting quinoa flakes for the oats (scant 1:1) and millet flour for the oat flour (1:1). We just pulled them out of the oven and they are fantastic! I love finding allergy-friendly recipes that are easily adaptable. Thank you so much for providing this wonderful recipe so my sweet girl can have her cookies! That made my day! Thanks, Julia!!! 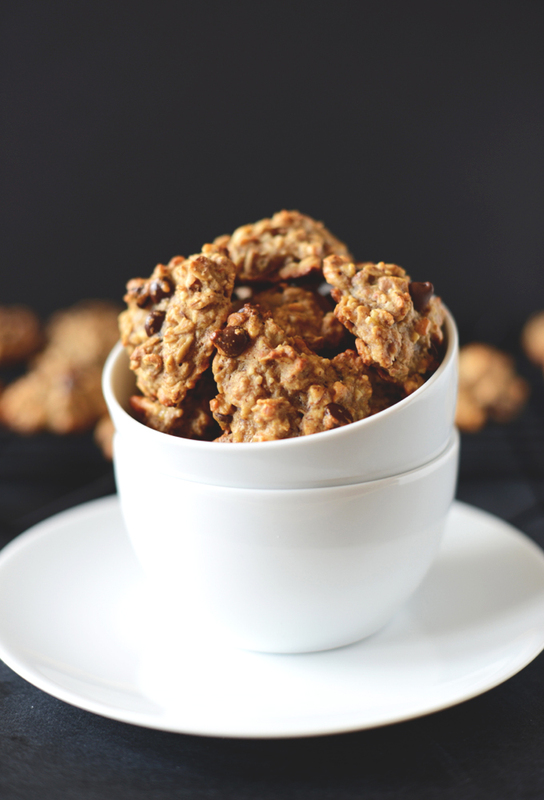 These are really hearty and delicious cookies – thanks for the recipe! I don’t bake/cook with refined coconut oil, so I used my usual – organic, unrefined, cold-pressed, virgin coconut oil – and the texture was really great … so I’m curious why you recommend refined oil or canola – since it’s such a highly GMO oil – any reason? What could I replace the bananas with? Also could I sub chia for the flax? My son is highly sensitive to both. Thanks, can’t wait to try this! Just made these and they are terrific! Instead of the Oat Flour I substituted in 2TBS of coconut flour. I also added dried prune pieces. Thank you for a great and easy recipe and also for teaching me about flax eggs! Perfect. Thanks, these are fabulous! My 4 year old son and I are GF and I’m vegan. Always love a good cookie recipe. My gluten-eating daughter and husband loved them too. Smells amazing, tastes wonderful!! Great recipe! I think you are my favorite baker because you understand me! Haha! You make awesome, hit-out-of-the-ballpark recipes with ingredients that aren’t so crazy that I buy a gallon just to use a teaspoon. It’s stuff I normally just keep in my kitchen, and I love that. Thank you so much for your awesome ideas, and keep going! Your photographs are beautiful also! Thanks Autumn! That’s what I aim to do! So glad you appreciate our methods and vision. Cheers! I’ve made these cookies like 5 or 6 times now so I figured I should stop by and leave a comment. These cookies are amazing! I took a batch of these to share with my yoga class this morning and they just loved them. Everything I’ve made from your site has been delicious. Thank you for sharing! Aw, thanks Alicia! I appreciate your review and positive feedback. So glad you’ve been enjoying them! WOW…I made these on Sunday night and I have about 4 left this morning…soon to be 3! I pack a few for snacks at work during the day. They are guilt free and so tasty!! I forgot to buy almond meal and subbed flaxseed meal instead and they turned out great. I used honey as well and the thick Ghiradelli dark choc. chips. Amazing recipe that I can’t wait to make again! Right? Aren’t they so addicting? Every time I make them I have to stop myself from eating half the batch straight out of the oven. Glad you enjoyed these, Jo Ann! These were so simple to make, yet so delicious! I added a dusting of cinnamon right before baking. I’m not sure I would classify these as cookies, but whatever they are, they’re tasty (; Thanks for the recipe! Yay! Love the dusting of cinnamon tip. Thanks for sharing, Savannah! Thanks for the sweet words, Flo! Yes, you can sub vegetable oil or melted coconut oil in this recipe. Hope that helps! I just made these. My family loved them. Made them exactly as written. Perfect. Thanks so much for sharing. These are AWESOME. I ended up using 1/2 cup oat flour, 1/2 cup rolled oats, 1 cup almond meal and 1/2 cup hazelnut meal. so still 2 1/2 cups dry just different proportions. This was due to the fact that I ground my oat flour, realized I only had 1/2 cup more of rolled oats, so I subbed the almond meal for the rest, Ran out of that and used hazelnut meal. Going by looks and texture, PB can be replaced with tahini or nut butters, or ground cashews, seeds or nuts (without additional oil or banana but I skipped the setting in the fridge). I omit or replace most of the almond meal because I have to, and have to use rice syrup instead of agave. Made 2 batches today and YUM. I like it’s not too sweet and soft. This recipe is easy for a beginner like me. Thanks! Just made these, have already eaten 3 of them while they are warm. We are GF and Vegan and after 1.5 years of baking that way this is a new favorite I’ve found today. Thank you!! These were so yummy!! I love the banana bread taste and texture.. I have been looking for a healthy breakfast cookie recipe for my kids since we’re always playing beat the clock in the am…We are GF and nut free so I subbed crunchy sunbutter for the peanut butter, flax meal for the almond meal, added 1/2 cup brown sugar(to make sure they would eat them)and as non-vegans I used 2 eggs. I’ve recently been diagnosed with celiac disease, which for a lot of people also creates a lactose intolerance so recipes like this are so great to find! Where do you buy your gluten free oats? I buy mine at Trader Joe’s, but I know Bob’s Red Mill is a good brand that has gluten free oats, too! Made these today, and they are great! I love how not sweet they are! Only thing is, the instruction on when to add the “flax eggs” is missing. I added it at the end, when I realized I hadn’t added it yet, but I thought I would let you know. Thanks for sharing. Oh I see. I guess I missed that. I just mixed it and set it aside to get “eggy”. They still turned out great! I have an allergy to nuts. Do you have a recommendation for a substitute on Almond Meal? Thanks. I’d suggest cornmeal, another nut meal – such as hazelnut, if that works – or additional oat flour. Hope that helps! Is the flaxseed you use for the flax egg the actual seeds? Or flaxseed oil? Not to b picky but chic chips are not vegan – look at the ingredients – but what harm is a leetle bit of choc going to do? dairy-free chocolate chips are vegan. There are tonnes are vegan chocolate products available. Pure chocolate doesn’t contain milk anyway. It’s added. I just made a batch of these, and they are DELICIOUS. I subbed g-free corn meal for the oat flour and almond meal because that’s what we happened to have, and I used maple instead of agave for the same reason. Did I mention DELICIOUS? Thank you for th recipe and to Monique at brownvegan.com who led me here. So delicious! I made them exactly as posted with the addition of dried blueberries and dried cranberries. The perfect addition to our breakfast rotation of tried-and-true favorites! Just made these and they were absolutely delicious. Thanks for the recipe!!!! 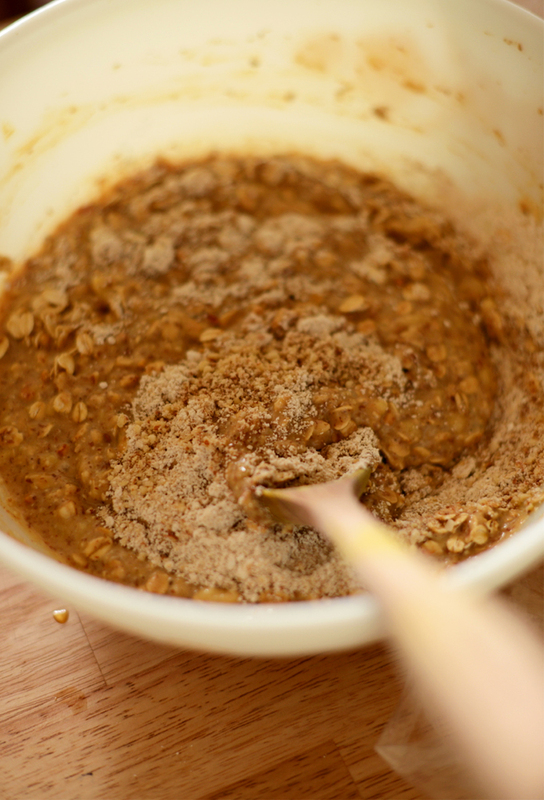 I’m allergic to peanuts, but I’d love to sub another type of seed butter and try this recipe! Any suggestions? I used tahini but measured with a dessertspoon, might’ve been more than 1/2 cup and I could detect the taste. Last time I used ground cashews and sesame, no almond meal and the cookies were better. I think any nuts or seeds, ground, would do, except pumpkin seeds which I can’t imagine in sweet stuff. Could you use something other than peanut or almond butter? Um, another nut or seed butter? Or, you could potentially omit it and see how it goes, although I really feel it helps with the texture/flavor. 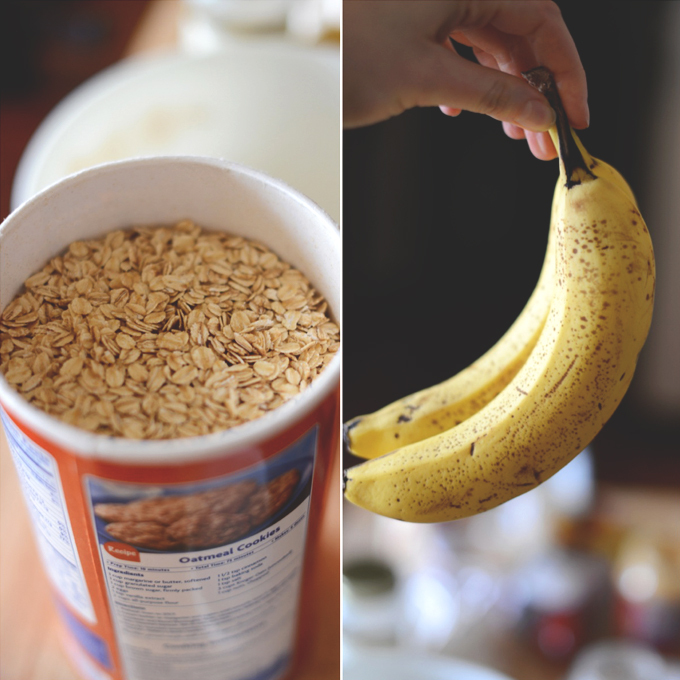 If you end up leaving it out, I’d increase the amount of banana you use so it gives it more moisture…hope that helps! How many cookies per serving? Nutritional info does not state that. Thanks! What’s the serving size on the nutritional info? These cookies look tasty and I want to try them. However I have a son who doesn’t eat bananas or fruit for that matter. What would you substitute for them? Um…maybe avocado for a similar texture!? Just compensate with more sweetness. You need something sticky and kinda thick like bananas. Hope that helps! Great recipe! Can you tell me how many are in one serving (for the nutrition info)? Agave is good for you ! Whoever told you it’s as bad ad sugar is very wrong ! Agave has become popular, because it’s a natural sweetener, but it’s actually not good for you, because it’s extremely high in fructose. In fact, agave has more fructose than HFCS! Excess fructose is a known contributor to type 2 diabetes and non-alcoholic fatty liver disease. 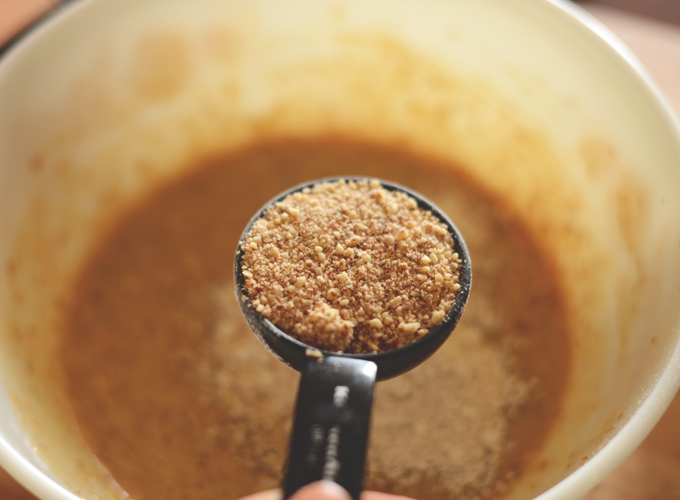 There are many healthier options for natural sweeteners. Thanks for sharing, Paige! I feel this is relatively new information in the healthy food community. I’m transitioning to maple syrup when possible. I use chopped dates or chopped dried apricots to substitute in approximately equal amounts or a little more to sweeteners such as sugar, coconut sugar, maple syrup, agave, honey, etc, in recipes such as this and in muffin recipes. I used chopped dried apricots here and it was fabulous. I prefer to use dried fruit over liquid sweetener or even coconut sugar. I did find that raisins have an unpleasing texture, not smooth like dates or apricots, so don’t sub well for sugars. My preschooler age vegan son adores these cookies and now so does my twin sister, who has asked me for the recipe and whose eyes go huge in delight, mouth stuffed with breakfast cookie, every time she stops by for one. Daily. And she works out, so I reckon it meets her approval on a healthy level. I also wanted to add that I substitute raw, creamy almond butter for the peanut butter to avoid aflatoxins and because I physically feel much better using raw almond butter than even when using roasted almond butter or especially peanut butter, even though I like the taste of peanut butter. Yum just made these two nights ago! So yum! I am seriously loving your site I have made at least 6 recipes from your website! Thank you for being my new FAVORITE blog! Am in need of gf vegan pb cookies–so thank you! Possible to leave out the almond meal? Allergic to almonds. I halved the recipe and loved these! I used brown rice flour instead of almond flour. Nice and banana bread-y. Thanks! I think so! Although, you may need to add a little more since almond meal isn’t as absorbent. Hope that helps! Agave is just as bad for you as sugar. Kayla, can you please tell me how to make “chia eggs?” I have chia seeds at home so just need to know! Jen, it’s just 1 Tbsp chia seeds + 2.5 Tbsp water! Hi. These look delicious and I am looking forward to trying them. Would you please clarify the 2nd item on the ingredients list? It says 2 flax eggs. Thanks so much! Hi Tori! That’s just a vegan egg substitute, so you’ll add 5 TBSP water to 2.5 TBSP flaxseed meal (ground flaxseed). Stir the two together, let it set for 5 minutes, and it forms an egg substitute for baking! Hope that helps. I’m so glad this was mentioned. I literally soaked while go flaxseeds waiting for an egg texture and nothing happened. I used chia seeds instead. I scrolled down here to make the same request. Can’t believe it hasn’t been changed since 2013 — it’s like saying “corn” instead of “cornstarch” or something. Totally inaccurate. what is not to absolutely love about cookies for breakfast! it also doesn’t hurt that they’re gluten free and vegan. You had me at breakfast cookie! The gluten free and vegan parts are just icing on the cake…er, cookie! These look like little bites of heaven. Plus they’re gluten free AND vegan? AND delish? Love it! Simple, but filling, how lovely! Loved them! I made them more into muffins as opposed to cookies. What a yummy treat. My 3 kids ate them up! !